Who are these grannies and why are they so mad? This isn’t a group of women who are angry at you for playing in their yards. These ladies got their start in Victoria, British Columbia in Canada back in 1986. No joke – this international activist organization made up of city-based Raging Grannies groups throughout the world started more than 20 years ago! The grannies didn’t begin with a nitpick, either. Originally called the Nuclear Emergency Response Team (NERT), the Raging Grannies of Victoria were concerned that the nuclear-powered ships of the U.S. Navy moored in Victoria’s harbor could create health and environmental risks to the residents of the city. 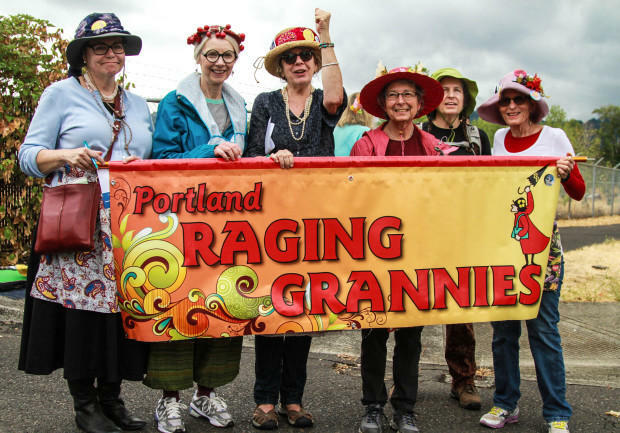 The Portland Raging Grannies are self-described as tough, brazen, well-informed, passionate, and serious about their mission, and take stances on a variety of issues facing the world through the use of street theater, satire, and humor. Where have I seen these grand ol’ girls around? You might recognize Portland’s Raging Grannies because they’re very serious about their activism, even if they often protest through songs and skits. Not only have they participated in many recent actions, they’ve also received a great deal of media attention. Believe it or not, grandkids aren’t necessary. You don’t need to be a “granny” to become a Raging one – just identify yourself as a woman and be 50 years of age or older. Naturally, there are other expectations such as attending meetings and participating in at least one action annually. If you fit these requirements and would like to know more, take a gander at the Portland Raging Grannies’ membership guidelines on their website. We couldn’t be prouder of our Portland Raging Grannies. They prove that no matter your age, you can (and should) speak your mind to make a difference. Portland’s Raging Grannies show the importance of having an opinion, speaking up, and presenting your ideals to the people who make decisions. Plus, these grannies demonstrate what it means to be dedicated to your cause and your country. Rage on, you crazy Grannies, rage on! Do you know of any other unique activist groups in Portland? Give them a shout-out in the comments!